Silver denarius, 19mm, 3.80gm, issued 2 BC - AD 4. Lugdunum mint. 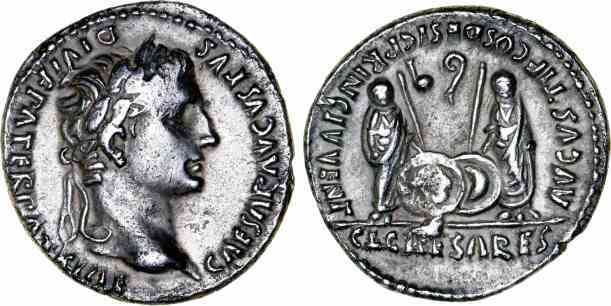 Obv: CAESAR AVGVSTVS DIVI F PATER PATRIAE, Laureate head facing right. Rev: C L CAESARES AVGVSTI F COS DESIG PRINC IVVENT, Gaius and Lucius standing facing holding shield and spears, priestly implements between. References: Sear 1597, RIC 207, BMCRE 519, RSC 43.